Run one test cycle to check capacity, or thousands to test battery life. Works with Lithium Ion, Lithium Polymer, Lithium Iron Phosphate, NiCd, NiMH, SLA, Lead Acid and Primary Batteries. 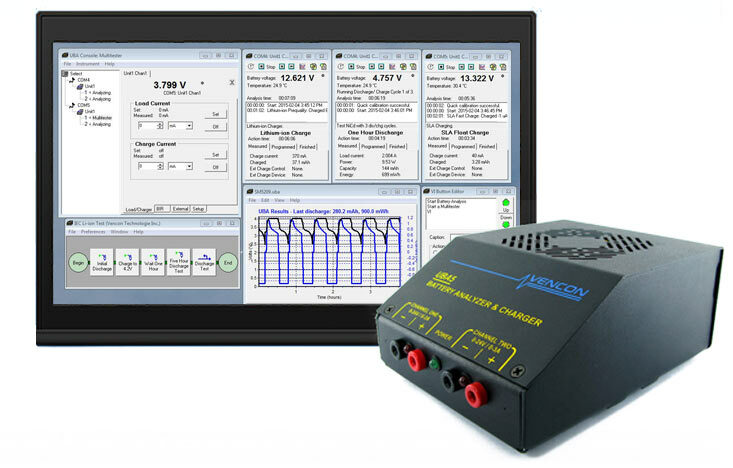 Create advanced battery analysis routines with a drag-and-drop interface using charge and discharge modules, loops and subroutines. Use one of the the analysis routines that come with your UBA as a starting point or build your own from scratch. …Or as complicated as this lithium ion camera load simulation routine that simulates the load that a camera battery will experience taking 200 pictures and then being recharged. This charge/discharge cycle is repeated until the battery can no longer provide the power for the 200 pictures. All battery voltages, charge and discharge currents and temperature along with the test results (capacity and energy) are stored in a standard csv compatible text file so you can easily import the results to a spreadsheet, or print them to have a dated record of all your battery tests and track batteries over time. 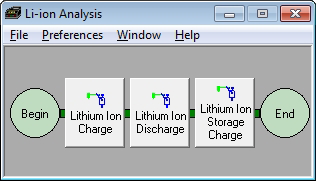 Setup customized Buttons to run battery analysis in a production environment where the operator has limited control. You can set the analysis to dynamically change its parameters based on real time test results. The Multitester can apply a load or charge current, it can also do a quick test to measures battery internal resistance and read any connected temperature probes. The UBA5’s fully programmable constant current charging (for NiMH/NiCd) and constant voltage charging (for Li-ion/SLA) makes it a very versatile charger, able to handle all of today’s chemistries, and tomorrow’s. There are still plenty of NiCds and NiMH batteries out there. The UBA5 can condition them to improve performance, and recondition those that can’t hold a charge to bring them back to life. It’s important that lithium-ion batteries be set to a specific state of charge (SOC) before shipping for safety or storage to preserve capacity. It’s simple to put the battery to a desired SOC with the UBA5. All Software is included and updates are free for life. The UBA5 has two channels that can each analyze a battery or can be combined with each other, or other UBA5s, for unlimited charge and discharge current. You can easily network together UBA5s to simultaneously control over 100 UBA5s from one PC. With temperature probes, you’ll be able to view and record the battery temperature during a battery analysis. Afterward you can load the results into a spreadsheet to plot the temperature curve along with battery voltage and current. You can also set the software to stop battery charging when the battery reaches a certain temperature or rate of temperature rise (dT/dt). Use our optional Battery Temperature Probes, use your own sensors, or use your battery’s built-in sensor. We will take care of you. If you need help setting up your tests, you can get support directly from Vencon president Marc Venis, a professional engineer with a Masters degree in Electrical Engineering and over 30 years of experience in the battery industry. “Allowed us to uncover battery issues that we otherwise would not have been aware of prior to product launch. 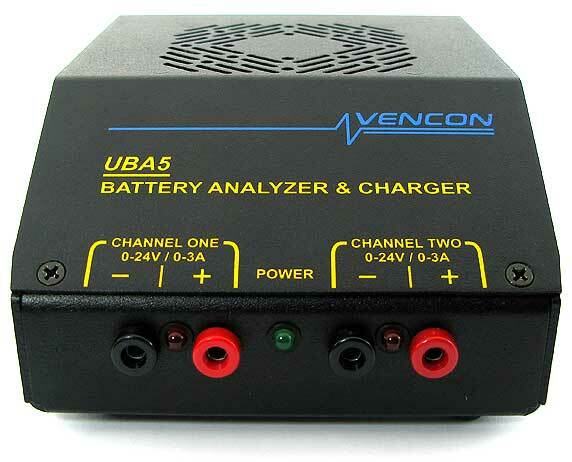 In 1992, Vencon released the UBAI and UBAII, the world’s first PC controlled battery analyzer. We kept improving it with the UBAIII, UBA4 and finally the UBA5 our current battery analyzer. If you need to test batteries, we know that you will be more than happy with the UBA5. If for any reason you are not satisfied, return it within 30 days for a full refund.